He manages the handcraft production unit at Silence, a training and employment centre for physically challenged people in Kolkata, and I was visiting to see if they had products that we could sell through our online shop at home. He tells me if we go to KFC we’re likely to be served by a deaf mute person. In India such physically challenged people are still very much discriminated against in employment and get no government assistance, which means those who can’t get support from family frequently resort to begging to survive. So a job at KFC is a big thing and we should support them. It’s not often you hear positive sentiments from a Fair Trader about multinational fast food chains, and given their sometimes dubious international reputations and tendency to displace small-scale cafes and food vendors Chanchal admits to a high degree of ambivalence about them. But he has to admit their relatively recent expansion in Kolkata has on balance been good for the disabled of the city. It all began in 1979 when Mr Roy, a senior geologist with the India Survey, witnessed an altercation between a small group of men and some nearby shop owners on a street in Kolkata. He realized the men were deaf and mute, and with a deaf and mute nephew Mr Roy knew sign language, so he intervened to assist them. It turned out the men were making hand-painted cards to sell to the shop owners, but the shop owners were taking advantage of their disabilities and wouldn’t pay them fairly, so Mr Roy asked the men to sell their cards to him and he’d sell them through his friends. This simple act of kindness led to the beginnings of Silence when Mr Roy subsequently left his lucrative job to dedicate his life to assisting the physically challenged full time. Silence now has about 130 trainee workers in their handcraft production unit, all deaf and/or mute or otherwise physically challenged, making cards, candles, incense and other handcrafts. 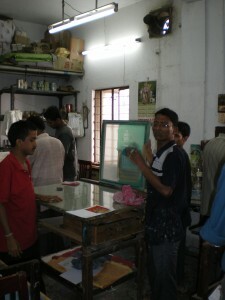 The trainees get free tuition plus many other benefits, and earn a modest but fair income while learning their skills. While Silence was initially set up as a workshop to provide permanent employment, Chanchal, who is physically challenged himself, is very proud of the current high turnover amongst the trainees. Other places offer more potential career advancement than Silence can, so central to their work now is a concerted and targeted placement program to assist trainees to move on to longer-term and more lucrative employment. Which also means Silence can take on more new trainees. Silence runs a shop in a handcraft emporium in Kolkata, selling their own and other Indian Fair Trade producers’ handcrafts, and the profits from the shop pay for all the administration costs of the organisation. Apart from some occasional grants for specific purposes (like installing a lift in their five storey production unit) the handcraft program is otherwise entirely self-sufficient, with Fair Trade and mainstream customers all over the globe buying their high quality crafts. 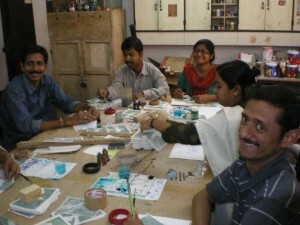 But Silence is about much more than assisting disabled handcraft workers. They also have a centre which Mr Roy still manages that provides training in computer skills, graphic art, accountancy and service occupations, amongst other things. These programs too are largely self-supporting, by taking in commercial work in graphic design, book-keeping, printing and other projects. Through the placement program the graduates from this centre often get work in advertising agencies, banks and government utilities, which value Silence graduates highly and actively recruit them. As Chanchal says with a wry grin, banks especially like them because they are focused and not easily distracted… and can be trusted with confidential information. And it’s from here that KFC and several other fast food operators have been recruiting staff for their expanding outlets around Kolkata. Silence has come a long way since that fateful meeting on the streets of Kolkata, and the training, employment and placement programs have earned wide acclaim, evidenced by several state and national government awards, but much more importantly by the recognition and respect given to the trainees and graduates themselves by mainstream businesses. 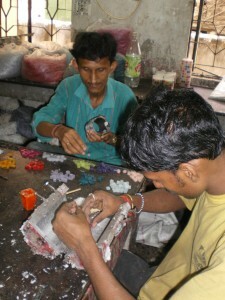 This entry was posted in Fair trade and tagged disabled, employment, fair trade, india, Kolkata by Paul Deighton. Bookmark the permalink.